The Auxiliary Markings Club (AMC) brings together a diverse group of collectors who are interested in the movement of the mails -- especially mail that had problems. The evidence of those problems are the markings applied to envelopes and packages as the mail was processed. They may have to do with inadequate postage, problems with the delivery address, accidents that occurred with planes, trains, ships or trucks carrying the mail, or literally hundreds of other reasons. Our members may have a primary interest in a type of auxiliary marking (e.g. "pointing fingers") or find auxiliary markings interesting as a sideline to the collecting of a special area (e.g. Prexie Postal History). The AMC serves both types of collectors; helping all to understand the origin and meanings of markings, and facilitatiing the exchanging of material of interest. Our club was founded in late 2003 by John Hotchner and Douglas Quine with the assistance and cooperation of Linn's Stamp News . With over 30 charter members, editor Tony Wawrukiewicz published the first edition of our quarterly Auxiliary Markings newsletter in January 2004. In the past, auxiliary markings have not been not well defined and information about them has been dispersed. As we grow, it is our intention to bring together available information in our newsletter, on this website, through an exhibit copy service (exhibit copies), a club library, in other publications, and by facilitating communications between interested members. We invite YOU to join with us. Together we can help each other, encourage more collectors to sample this fascinating field, and encourage dealers to carry the kinds of material that we enjoy. Look at our website, and our newsletter tables of contents from the past 5 years. If you have questions or suggestions, the officers will be happy to hear from you. You can join by regular mail, or using PayPal right here on the website. See the section below titled HOW TO JOIN. Auxiliary Marking: Postal marking applied to covers by handstamp, machine cancellation, a stick-on label, manuscript markings, or by mechanical or electronic methods such as addressograph or computer, indicating that the covers were given special attention due to some special circumstance. A broad definition would include accompanying postal service letters, and ambulance covers in which damaged or misdirected mail has at times been delivered, and markings placed on covers by institutions other than the postal service, such as the military, prisons, hotels, etc. Auxiliary Markings are sometimes known as Instructional Markings or Supplementary Markings. In general, we try to conduct "show and tell" sessions three times a year: at the APS AmeriStampExpo in winter, the APS StampShow in summer, and at our annual meeting, which rotates among various cities in the U.S. from year to year. 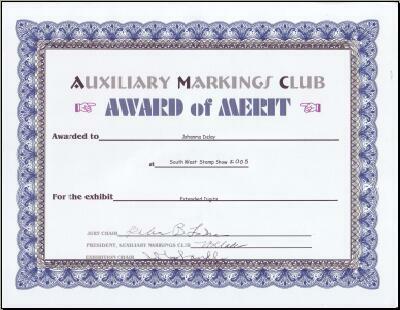 Other stamp shows may also award Auxiliary Markings Club awards for Auxiliary Markings Exhibits. the Auxiliary Markings Club will have a "show and tell" session at INDYPEX 2018 at the Hamilton County Fairgrounds, 2003 Pleasant Street, Noblesville IN. The session is scheduled for 11 am Saturday, October 6, 2018. We hope that as many of you as possible can attend. Bring your interesting covers! Please renew your Auxiliary Markings Club membership now before you forget. Dues for 2019 are $18 online or mailed (see the links below). We are pleased to announce that the 2018-2019 Officers have been elected and are listed below. Marks used by Hollywood studios to indicate that the fan letter was sent to the incorrect studio. 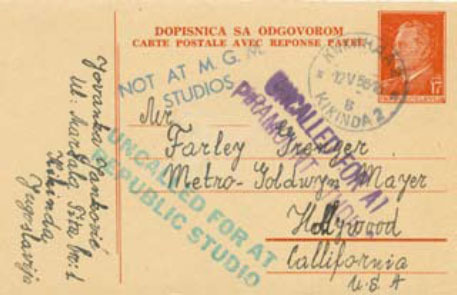 Forwarding marks used by the Hollywood studios. Marks used by Hollywood fan mail services and publicity agencies. 54 fan mail covers bearing auxiliary markings illustrated in full color. Over 70 auxiliary markings recorded and classified. Auxiliary Markings Club member pricing (with spiral binding & clear plastic cover) is $15.00 (including domestic postage), $16.50 to Canada (including postage), and $21.50 worldwide (including postage). Nonmember pricing is $21.00 (including domestic postage), $22.50 to Canada (including postage), and $27.50 worldwide (including postage). Orders may be placed on-line (end of this web page). The Auxiliary Markings Newsletter is now available on-line to current members. The July 2011 issue discusses how to gain access to all back issues (including some in color that were originally published in black and white). In an effort to streamline our website, improve the quality of our search engine listings, and prudently invest membership funds, we have migrated the postal-markings.com (".com") web link to postal-markings.org (".org"). The ".com" page was a "safety net" for those who mistyped our web address (URL). As a volunteer organization rather than a commercial enterprise, the ".org" address has always been the correct address. If you have bookmarks to our obsolete ".com" pages, please update them to the ".org" pages. As mentioned in the April 2010 newsletter, the Held for Postage study group has collected their holdings into a 'Held for Postage' Mail Auxiliary Markings study group PDF "catalog" to allow other members to review the materials and add in any missing materials. Please advise Tony Wawrukiewicz of any items that you have which are not represented in this "catalog". Cooperative information sharing with International Machine Cancel Society: PDF download copy of Michael Ludeman's 28 page A New Type of "Return to Sender" Endorsement Created By Ink Jet Printer Technology Part 1: Texas P&DCs"
Criteria: The Auxiliary Markings Club sponsors the Richard B. Graham Award to recognize the exhibiting of auxiliary markings. The exhibit must have won a national Silver Award or better and include a significant percentage of auxiliary markings. The award is open to any exhibit in the open competition class at the show hosting the Auxiliary Markings Club annual convention. Membership in the Auxiliary Marking Club or the sponsoring organization of the exhibition is not a requirement for winning the award. Criteria: The Auxiliary Markings Club sponsors the President's Award to recognize the exhibiting of auxiliary markings. The exhibit must have won a national Silver Award or better and include a significant percentage of auxiliary markings. The award is open to any exhibit in the single frame competition class at the show hosting the Auxiliary Markings Club annual convention. Membership in the Auxiliary Marking Club or the sponsoring organization of the exhibition is not a requirement for winning the award. the Auxiliary Markings Club had a "show and tell" session at the APS StampShow in Columbus, OH. The session was at 3 p.m. Friday, August 10, 2018 in room B 242 in the convention center. August 20-25, 2015 was the APS StampShow in Grand Rapids, MI with our Show and Tell session included 16 participating collectors. May 15-17, 2015 was our Annual Meeting at ROPEX in The Greater Canandaigua Civic Center, 250 North Bloomfield Road, Canadaigua, NY. The Club had 37 frames of exhibits, a table, and a dinner. The Board of Directors meeting was held on Friday, May 15. The General Membership meeting with a "show and tell" session was Saturday, May 16. An Auxiliary Markings Club "Show and Tell" Meeting: was held at the APS AmeriStampExpo in Riverside, CA February 13-15, 2015. The session was scheduled for room 3 in the Riverside Convention Center at 1 p.m. Friday, February 13 to share and discuss covers with auxiliary markings. March 22-24, 2013: St. Louis Stamp Expo: Auxiliary Markings Club Annual meeting celebrated our tenth anniversary. Meeting included a board meeting, general membership meeting and "show and tell" session, a Friday evening dinner, two seminars, and we had a table at the show, along with several exhibits. August 8-11, 2013: APS StampShow, Milwaukee, WI had a "show and tell" session at this show. The StampShow 2011 AMC "Show and Tell" Meeting: Greater Columbus Convention Center, 400 North High Street, Columbus, OH on Friday August 12, 2011 at 1:00 pm in room E150 to share your interesting covers with the members. We had an Auxiliary Markings Club Show and Tell session at AmeriStamp Expo/ TEXPEX was held February 20-22, 2009 at the Arlington Convention Center, 1200 Ballpark Way, Arlington, Texas. The AMC Show and Tell session was at 11 a.m., Friday, February 20, 2009 in room M-10 of the Arlington Convention Center. This is an opportunity to show your covers and perhaps solve some mysteries and obtain answers to your questions about your covers. It has become a popular activity. The AMC 2009 Annual Meeting was held at PIPEX 2009 . PIPEX 2009 was May 22, 23, and 24 (note corrected dates) at the Doubletree Hotel Lloyd Center in Portland, OR. The Show hours will be 10:00 a.m. to 6:00 p.m. Friday and Saturday, and 10:00 a.m. to 4:00 p.m. Sunday. PIPEX will include over 200 frames of exhibits, over thirty dealers, including the United States Postal Service, a large youth program, a “Grandma’s Attic” booth to answer questions and provide free appraisals, a silent auction, first day covers, and seminars and meetings sponsored by participating societies but open to the public. Admission is free to the public. The AMC held a "Show and Tell" meeting on Friday, August 15, 2008 at StampShow 2008 in Hartford CT.
Washington DC 2006 - World Philatelic Exhibition was a phenomenal show (the show web site is managed by our own Tom Fortunato who has posted images). The Auxiliary Markings Club was out in force. We participated with a frame in the "Society" area hosted by our own John Hotchner. We held our annual meeting, which was well attended. Ralph Nafziger arranged a show and tell with eight of our members showing items of interest in a show and tell format. Mike Mead, Tony Wauwrukiewicz, Bill Geijsbeek, Alan Warren, Ralph Nafziger, Mark Goodson, Jackie Alton and Doug Merenda presented us with interesting puzzles, solved and unsolved. We discussed having regional meetings, as our membership is spread so widely across the country, with members in other countries as well. We will have such a meeting in Chicago in conjunction with StampShow in August. Those fortunate enough to make it to the National Postal Museum, could see John Hotchner's "20th Century United States Auxiliary Markings Documenting Delay of, or Inability to Deliver, the Mail: The First Fifty Years." September 23-25, 2005 Second Auxiliary Markings Club annual meeting at the Southeastern Stamp Show (formerly Peach State Stamp Show) www.stampclubs.com/sestampshow.htm. The club's awards were offered for the best exhibits. ROPEX , Webster Community Field House, Webster Thomas High School, 800 Five Mile Line Road, Webster, NY (suburb of Rochester). Exhibits of any kind are welcome from club members. The first competitions for the Richard B. Graham Award for Excellence in Exhibiting Auxiliary Markings and the President's Award for Single Frame Auxiliary Marking Exhibiting Excellence (described above) will be held at ROPEX 2004. The ROPEX show web site had details about area hotels (which book early). Click "PayPal Buy Now" for ON-LINE MEMBERSHIP ENROLLMENT. 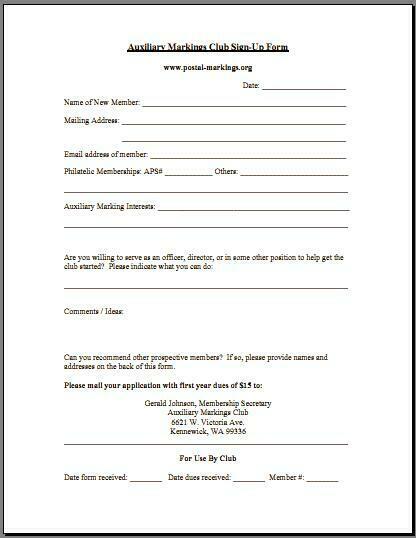 FOR NEW MEMBER MAIL ENROLLMENT for 2019 MEMBERSHIP (1 year) , please complete the Sign-Up Form (available below to print in Adobe Acrobat PDF or Microsoft Word formats) and mail $18 to the membership secretary. Click "PayPal Buy Now" for 2019 ON-LINE MEMBERSHIP RENEWAL of $18. RENEW MEMBERSHIP for 2019 BY MAIL , please complete the Membership Renewal Form (available below to print in Adobe Acrobat PDF or Microsoft Word formats) and mail $18 to the membership secretary. 2004: Click "PayPal Buy Now" to purchase the 2004 Auxiliary Markings Newsletter BACK ISSUES for $15. 2005: Click "PayPal Buy Now" to purchase the 2005 Auxiliary Markings Newsletter BACK ISSUES for $15. 2006: Click "PayPal Buy Now" to purchase the 2006 Auxiliary Markings Newsletter BACK ISSUES for $15. 2007: Click "PayPal Buy Now" to purchase the 2007 Auxiliary Markings Newsletter BACK ISSUES for $15. 2008: Click "PayPal Buy Now" to purchase the 2008 Auxiliary Markings Newsletter BACK ISSUES for $15. 2009: Click "PayPal Buy Now" to purchase the 2009 Auxiliary Markings Newsletter BACK ISSUES for $15. 2010: Click "PayPal Buy Now" to purchase the 2010 Auxiliary Markings Newsletter BACK ISSUES for $15. 2011: Click "PayPal Buy Now" to purchase the 2011 Auxiliary Markings Newsletter BACK ISSUES for $15. 2012: Click "PayPal Buy Now" to purchase the 2012 Auxiliary Markings Newsletter BACK ISSUES for $15. 2013: Click "PayPal Buy Now" to purchase the 2013 Auxiliary Markings Newsletter BACK ISSUES for $15. 2014: Click "PayPal Buy Now" to purchase the 2014 Auxiliary Markings Newsletter BACK ISSUES for $15. 2015: Click "PayPal Buy Now" to purchase the 2015 Auxiliary Markings Newsletter BACK ISSUES for $15. 2016: Click "PayPal Buy Now" to purchase the 2016 Auxiliary Markings Newsletter BACK ISSUES for $15. 2017: Click "PayPal Buy Now" to purchase the 2017 Auxiliary Markings Newsletter BACK ISSUES for $15. 2018: Click "PayPal Buy Now" to purchase the 2018 Auxiliary Markings Newsletter BACK ISSUES for $15. The AMC exhibit copying service offers exhibits for your library by three club members at cost as a service to our membership. We regret that copying costs have increased substantially in addition to the $5 (small exhibit) to $10 (large exhibit) surcharge for international shipping (outside USA) because the costs which we have been absorbing have become so high. Should you decide to order a copy, do so by ordering on-line (below), by emailing Ralph Nafziger at , or writing Ralph Nafziger, P. O. Box 1476, Albany, OR 97321. Remember that any copy you receive will be a second generation, a copy of a copy. Though not as clear as the initial copy it remains a fine reference. since September 19, 2003 (last updated January 1, 2019). Copyright (c) 2003-2019 by the Auxiliary Markings Club.